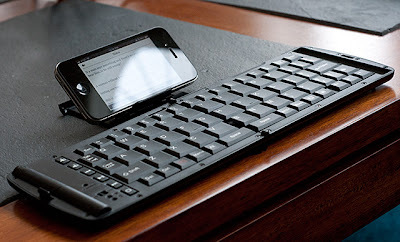 If you want to work faster in your iPhone, iPad and other Mobile Phones like you work on your Personal Computer, then you can use Bluetooth Keyboard for iPhone and iPad . I have searched many bluetooth keyboards for Mobile Phones and Touchscreen Devices especially for iPhone and iPad, and finally got my hands into most promising and best Bluetooth Keyboard for Mobile Phones, which i am going to review today in my blog. 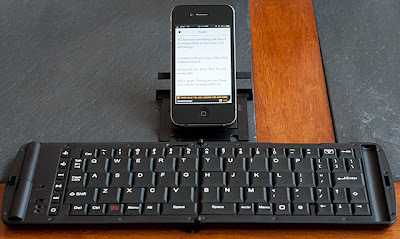 Verbatim has made bluetooth keyboard specifically designed for iPhone, iPod Touch and iPad. Its Bluetooth capability also works with other mobile phones, but it really shines with Apple devices, with its full set of keyboard shortcuts that worked well with my iPhone. The keyboard’s typing action is like most laptop keyboards rather shallow, but still usable. Touch typists might not like the varied size of the keys, where, for example, the “G” key is slightly smaller, while on the other hand, the “V” key is larger. It’s also strange to have two small space bars, but I got used to it quickly. Still, you’ll have to make slight compromises for this portability. Looking at the keyboard, it reminds me of the old favorite Palm 3245WW folding Bluetooth keyboard that some people still like so much they’re willing to pay upwards of $200 for it. But this verbatim model goes one step further with a feature that differentiates it from all others: its transport controls let you tend to your music on iPod, iPad or iPhone. You can Buy Verbatim's Bluetooth Keyboard from Verbatim website for $104 price, For that price, it’s not worth it, but then I was relieved to find it for $53 on Amazon . For that, it’s a good deal, deserving of a place in your carry-on bag. So what are you waiting for Go and Buy one for your iPhone, iPad and other touchscreen devices.